"Come on Isabel, let´s go shopping!..." 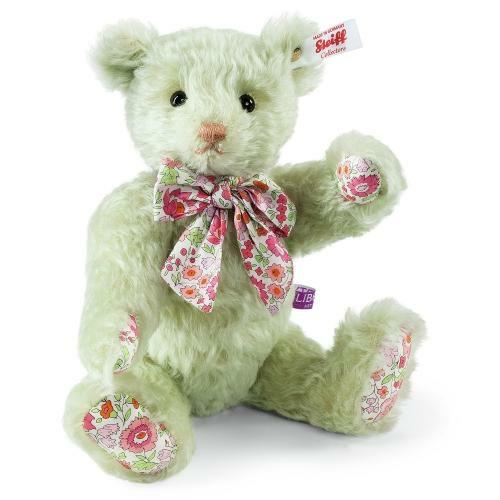 Stylish Fleur is the next model in the range of Steiff Liberty bears. Fleur combines a flowery fabric in a fresh spring look with her light green, softly curled hair in the finest mohair and her pink, hand-embroidered nose are enhanced by the beautiful floral print, Danjo, from Liberty of London. The lovely pinks, red and green colourway beautify her a la mode bow and her foot pads. She radiates style and fashion and is extremely proud to wear her "Liberty London" label - her gold-plated "Button in Ear" distinguishes her as a genuine Steiff collector bear. Fleur follows Emeley, Violet and Isabel on the catwalk and is limited to 1,500 pieces. If the item states for 'preorder only' please call 01629 814811 to order.